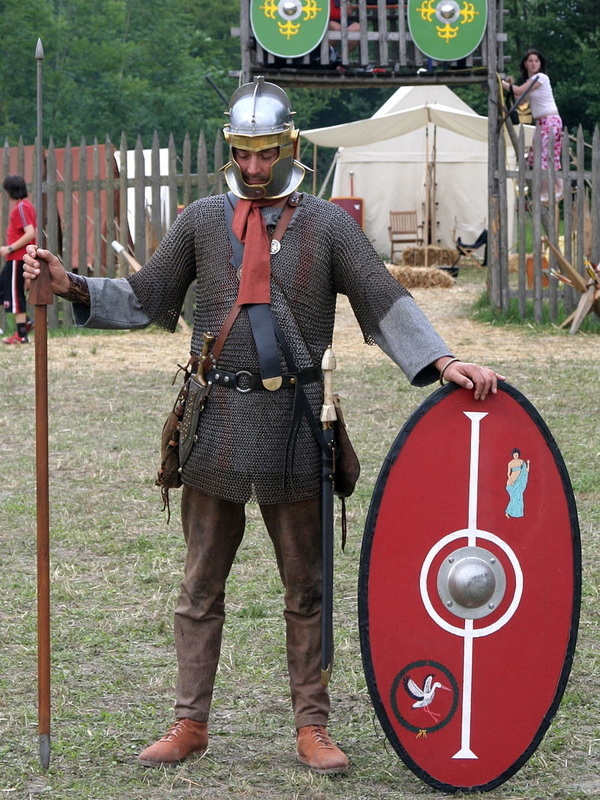 Roman auxiliary soldiers hailed from all parts of the empire, and many retained their native dress and expert military specialties. 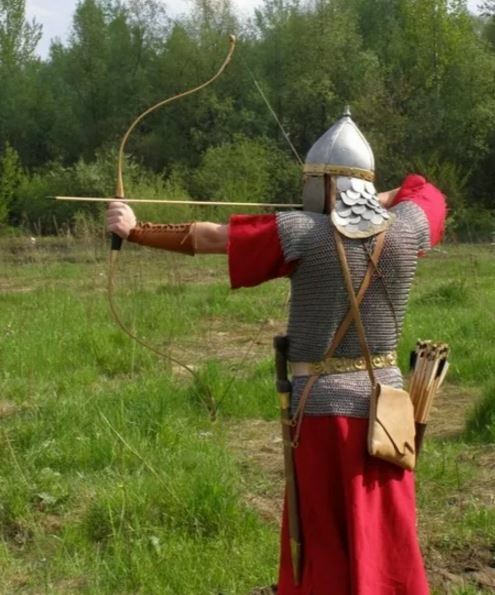 For instance, the Balearic Slingers fired lead pellets with a further range than arrows, while the Numidan and Germanic cavalry were famed for their horsemanship. Our Legio VI Ferrata consists of Roman soldiers, but we would welcome any member that wanted to play some specialist auxiliary soldier. 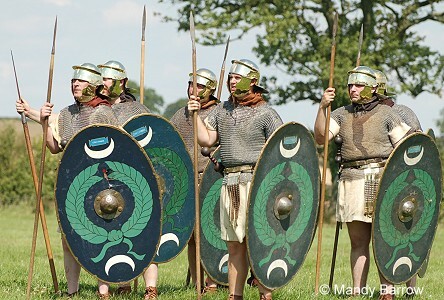 It is normal in Roman re-enactment groups to portray auxiliary soldiers wearing chain-mail, balteus, spear and oval shields, as pictured. Vegetius states that all Roman soldiers were trained in the use of the bow. 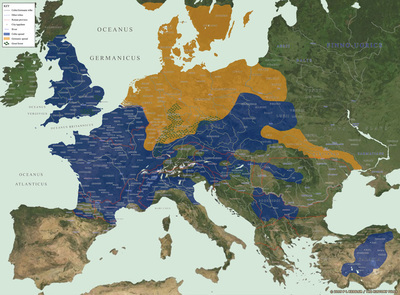 By the mid 2nd century there were 32 auxiliary sagittarii (arrow-men) units: 13 with Syrian names, 7 Thracian, 5 Anatolian, one from Crete and the other 6 uncertain. They used a compact and powerful recurved composite bow. 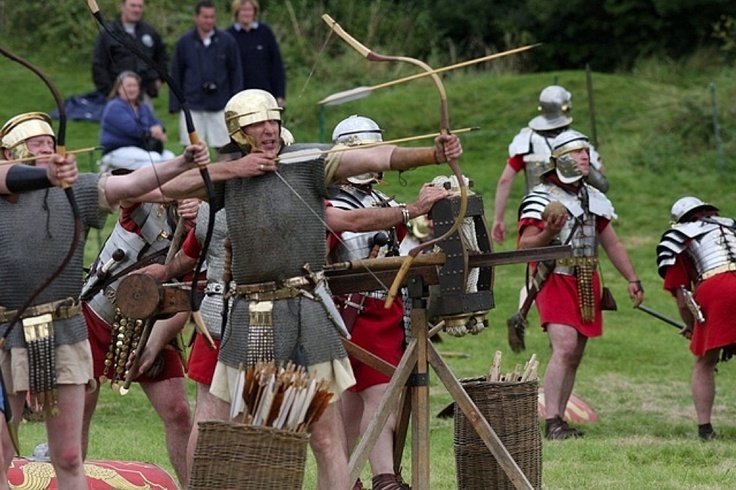 The archers stood in battle behind the infantry, loosing arrows over their heads. 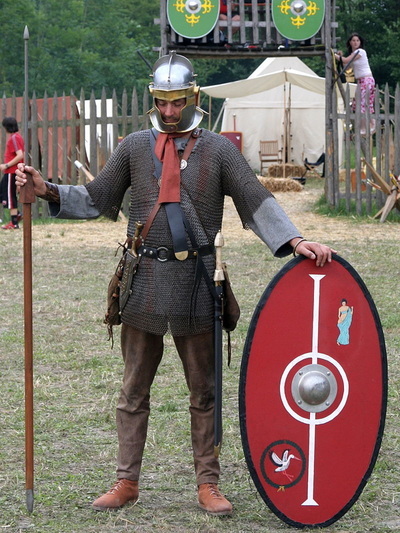 (a) with scalar cuirass, conical steel helmet and cloak (Syrian or Anatolian). (b) without armour, with cloth conical cap and long tunic. (c) equipped like auxiliary foot-soldiers, but carrying bows instead of javelins (Syrian). Separate from the auxiliaries were barbarian socii (allies) or foederati (treaty-troops) fighting in about 40 units of 300 men each. They kept their own native leadership, attire and equipment. 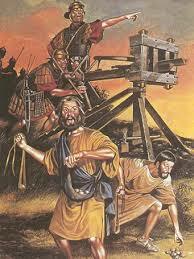 On Trajan's Column they are portrayed in a standardised manner, with long hair and beards, barefoot, stripped to the waist, wearing long trousers held up by wide belts and wielding clubs. In reality their attire and weapons would have varied widely. Marcus Aurelius (170 AD) sent 5000 captured Sarmatian cavalrymen as foederati to garrison Hadrian's Wall after their defeat in the Marcomannic Wars. The Tombstone of Titus Flavius Bassus, son of Mucala. 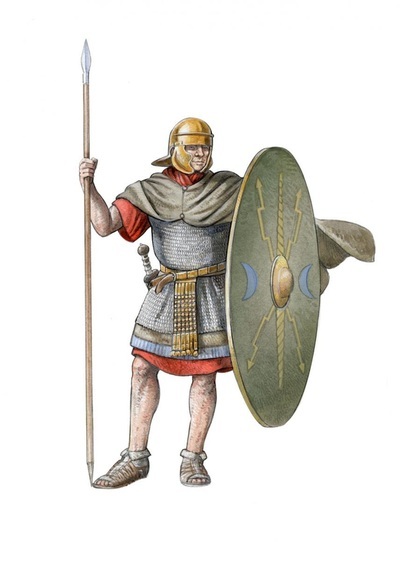 An auxiliary soldier from the Thracian tribe of Dentheletae, he belonged to the Ala Noricorum. He died at age 46 after 26 years' service. Bassus' adopted Roman names, Titus Flavius, indicate that he had gained Roman citizenship by serving the required 25 years in the auxilia. The names adopted would normally be those of the emperor ruling at the time of the citizenship award. This tombstone is from the late 1st century, and is in the Romisch-Germanisches Museum in Cologne, Germany.